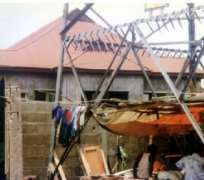 The Lagos State government will demolish structures built under electric transmission cables across the state, the state's Commissioner for Environment, Mr Tunji Bello, said on Saturday. The commissioner said structures under high tension installations were fraught with grave danger, adding that it also constituted environmental nuisance. He spoke while monitoring the monthly sanitation in Ayobo/Ipaja area of the state. According to Bello, the government can no longer afford to watch residents to endanger their lives, adding that officials would soon remove the illegal structures. 'In fact, I have instructed the Ministry of Physical Planning and Urban Development to deal with that. We have said time and time again that people shouldn't build under high tension cables and poles because it is dangerous, but they won't listen. 'And some of these people still ask us for amenities like drainages and so on. Who will ever do that? We are sorry we cannot do drainage for people under high tension,' Bello said. The commissioner warned residents against building on flood plains, saying the practice threatened lives and the environment. He advised residents against dumping refuse in drains and canals as doing so could cause flooding. He appealed to residents to co-operate with government in improving the environment by abiding with environmental laws.